Long-in-development Explodemon! was originally a title for both WiiWare and PSN. 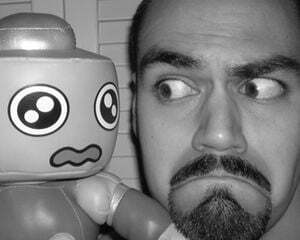 Along the way, it became a PSN-exclusive, bringing a frown to many a face. 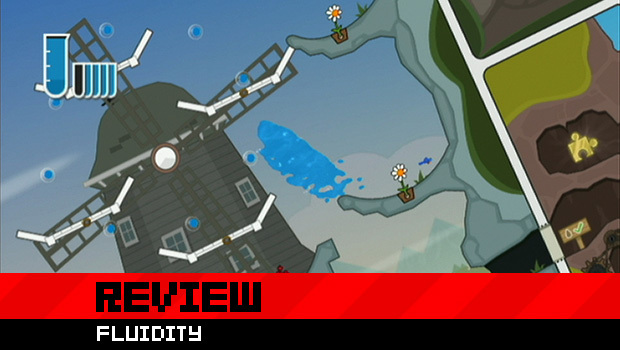 Surprise, surprise -- developer Curve Studios popped into PAX a few short months back to demo a new WiiWare title, Fluidity. Fast forward to today, Fluidity has been released and Explodemon! is still sweating it out in the workshop. So, what does this crazy water-based physics puzzler with a premium 1200-point price tag have to offer Wii fans? In a word: lots. The magical tome Aquaticus has been infested by a malicious goop known as the Influence. The spirit of the book has called upon you, a sentient pool of agua, to scour the pages and wash the ink away. 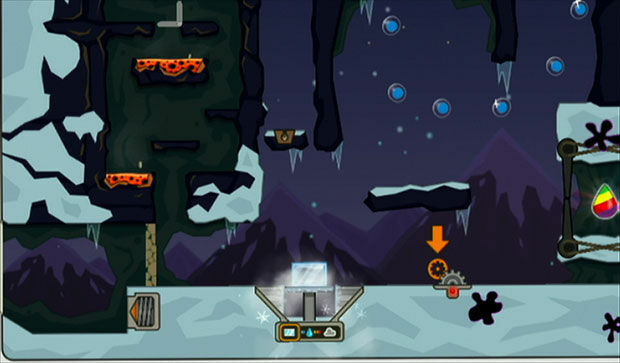 By tilting and shaking the Wii remote, you maneuver past various traps, puzzles, and even a minigame or two in order to collect Rainbow Drops and restore the book's power. Progression is equal parts platforming and action-adventuring, a little Super Mario 64 here and a dash of Metroid there. Instead of tackling a multitude of smaller levels, you visit four worlds each massive in size and scope. The Rainbow Drops you collect unlock doors to new zones on the map, and the abilities you acquire over the course of the game allow you access previously unreachable areas. Because there is so much ground to cover, warp points are available to reduce travel time. All in all, your play time will run you between ten to fifteen hours at the least. This is a massive game with lots to do and see, so I'm thankful that the premium price tag is representative of actual content. The worlds are literally chapters of the Aquaticus that span six pages, and the rooms you pass through are illustrated panels. 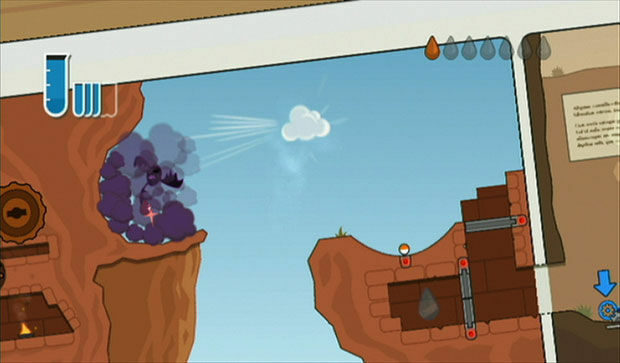 This comic book arrangement allows for a healthy variety in scenery, where one panel can be a lava-filled catacomb while the adjacent panel is a sun-drenched water park dotted with slides and sand. All the objects are colored in bright hues without any shading, lending to the flat-world aesthetic. They really look like moving illustrations on a page. The game is played with the Wii Remote sideways. You slide by tilting in either direction, jump by shaking the remote, and perform various techniques with the 1 or 2 buttons. Controls are extremely simple but polished to a bright sheen, with every nuance of movement affecting your actions. If you goof up, the failure lies on you, not the controls. Curve Studios did a fantastic job of capturing the essence of liquid -- controlling a body of water can be a harrowing experience as the water splits into dozens of droplets that get caught in nooks and crannies. It's imperative to keep all the water pooled together lest the smaller bodies evaporate. Thankfully, you can collect floating water droplets to restore the supply lost from evaporation or enemy contact. You learn new powers in your travels, the greatest of which is the gather ability. Hold down the gather button and the divided water pools are attracted to the largest globule like a magnet. Holding down the button for too long will cause the water to explode in all directions, a technique that comes in handy when you need to water a flower that's perched on a high ledge, for example. Late in the game, you earn the squirt ability, which allows you to transfer your water up great heights or across great distances via a pressurized stream. You aren't just splashing about the whole time, as state changers are scattered about to grant you ice and steam forms. Ice can break through certain barriers and even stick to surfaces to allow for wall-jumping. Steam is the most versatile of the states, allowing you to shoot lighting bolts for frying foes or charging machinery and to blow air gusts for turning windmills or clearing away poison clouds. Every ability at your disposal is put to the test time and time again. You have to locate loose cogs missing from gate-opening mechanisms, return goldfish to their bowl, and engage in some rather perilous precision platforming. The most clever challenges are the single instance events, like operating a fire truck to extinguish a burning building, directing a basketball into a hoop, and playing around with that cheap-as-all-hell coin pusher machine that you find at some arcades and carnivals. Along the way, you also collect puzzle pieces that look suspiciously like Banjo-Kazooie Jiggies that unlock playroom minigames for side diversions. The difficulty curve throughout is nice and steady but slopes upward sharply in the final world like you wouldn't believe, throwing at you Rube Goldberg contraptions of Machiavellian design. All of sudden, you are falling into lava pools at every turn and restarting sections countless times over. If you are like me, who earned enough Rainbow Drops in the earlier chapters to jump straight to the final boss "battle" without needing to explore much of the last world, you won't be quite as prepared as you may have hoped. As a general rule of thumb, it's best to take it slow and clear as much of a world as you can before entering a boss room or moving on to the following chapter. Aside from those hurdles, you may find controlling the water in its various states to be a bit troublesome, especially once the pressure starts beating down on you. What I've found is that the physics are extremely realistic to the point that every feature of the landscape can affect your maneuverability. For example, it's more difficult to scale a rocky surface in ice form as opposed to a smooth wall. Also, where you initiate a jump and how you are tilting the controller can mean the difference between a pathetic hop and a tremendous leap into the heavens. It's a fair system, just one that demands a lot of practice and patience. Regardless, Fluidity is pleasant end-of-year treat for WiiWare owners full of grand exploration. 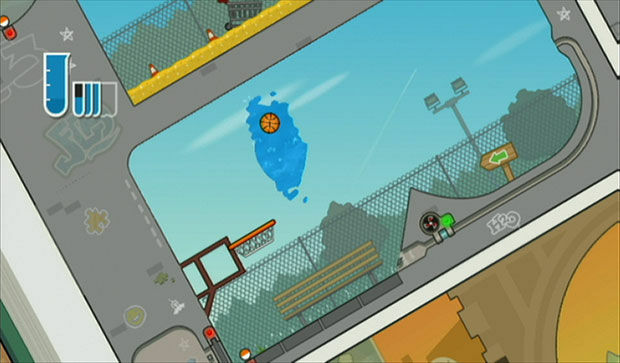 The water physics are top-notch and, in combination with the various creative puzzles and obstacles, provide a healthy dose of challenge, though some players may feel put off by late-game difficulty spike. It's clever, at times calming then nerve-wracking, and all around fun.